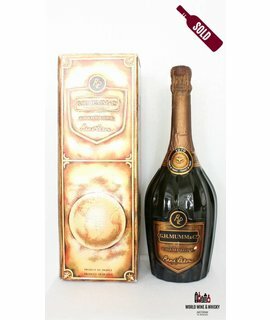 G. H. Mumm & Cie, situated in Reims in northern France, is one of the largest Champagne producers and it is currently ranked 4th globally based on volume of bottles sold in 2015. Foujita also gave G.H. Mumm a fresco depicting "The Virgin in the Vines". The rose featured in the painting became the cuvée's emblem and appears on the metallic cap on top of the cork of the rose Champagne.